Rooted Floating Plants, also referred to as Deep Water Plants, have their roots sitting in the bottom of the pond (or in a container on the bottom of the pond) and their leaves reach up to the water’s surface. They are sun-loving plants and can survive with 10-20cm or more of water above the plant’s crown. The best known examples include Waterlilies (Nymphaea spp.) 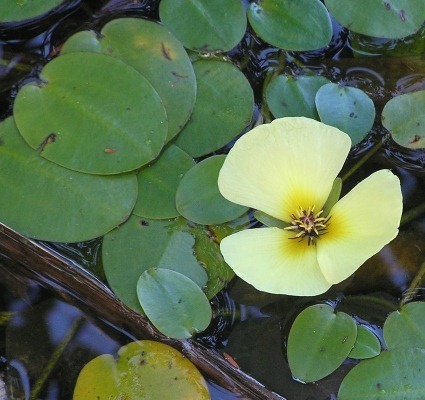 and Lotus (Nelumbo spp.). They produce floating leaves that shade the water, which reduces the growth of algae. They also provide shade and a hiding place for fish. Many rooted floating plants also produce spectacular flowers (most species need full sun 10 hours a day for best flowering). Place these plants away from fountain sprays, as strong water movement or splashing water inhibits water lily growth. The leaves and flowers are constantly replaced and should be removed when they die off otherwise they will rot down and create more organic matter that can algae feed off. Submerged Plants. also called Oxygenators, grow with their roots anchored in soil, but the leaves stay underwater. Oxygenators are essential for keeping the pond healthy and the water clear. 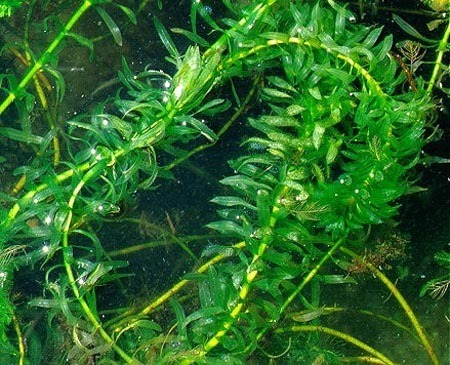 The best known examples include Anacharis (a deep green plant with many delicate leaves, which will grow in water 15cm to 150cm deep) and Hornwort (dark green grass-like leaves, need 15cm to 30cm of water above the crown). 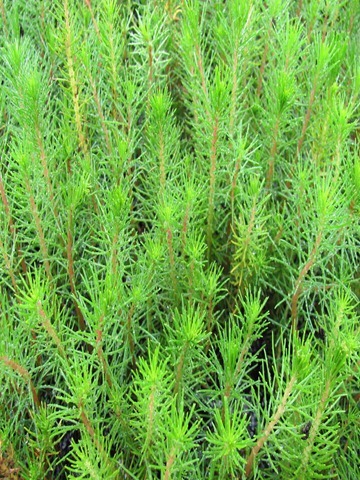 These plants absorb carbon dioxide and release oxygen into the water, and by oxygenating the water they help it support more aquatic life such as fish and beneficial aquatic insects. 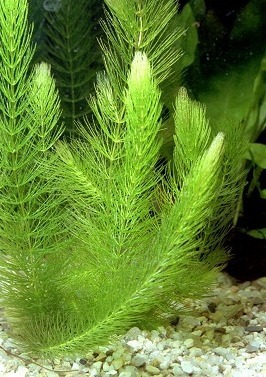 They also absorb excess nutrients in the water and help purify it, which reduces the growth of algae. Oxygenators also provide food and shelter for fish. The leaves, which are usually fern-like, lacy, or hairy, provide cover for the microscopic aquatic life forms which are an essential part of a balanced aquatic ecosystem. Oxygenators can multiply very quickly and outgrow their space if not cut back regularly. Remove excess plants and compost them, they are a great source of plant nutrients. You will notice that fish eat these plants too, and that is not a concern because they can regrow quickly, and the fish just help control their growth. These plants are usually planted in pots that are sunk to the bottom of ponds, so they sit vertically in the water, but they can also be left to free float on the water surface horizontally, though this doesn’t look as tidy. Floating Plants are plants that float on the water’s surface, they do do not need soil, nor to be anchored to kind of base, and they grow by extracting nutrients from the water. They control algae in two ways. Firstly, by shading the surface of the water, they restrict the light that algae needs to grow. Secondly, they are act as natural filters to remove excess nutrients from the water, which limits the nutrients available to algae. They also have many other useful functions. Duckweed is a protein rich food source for fish, goldfish consume it greedily! Azolla is a tiny fern which supports nitrogen-fixing bacteria just like legumes do, so it captures its own nitrogen from the air. 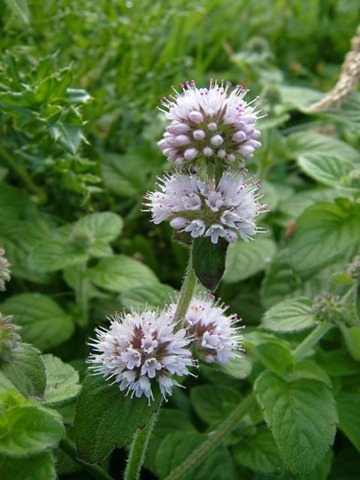 This makes it a great nitrogen source for the compost pile or as a source of rich food for worm farms. Marginal Plants grow in the shallow margins around the edge of a pond, and they can survive with up to 10cm of water over the plant crown. These plants do best in still to slow moving water. These plants can serve several functions. They can be decorative, adding colour and height to any shape of water garden, as well helping to blend in the edges of a pond into the surrounding ground. They also provide more practical functions, such as shelter from the wind, and shade. They also serve as a barrier around the water’s edge, providing protection to fish and frogs from predators. . 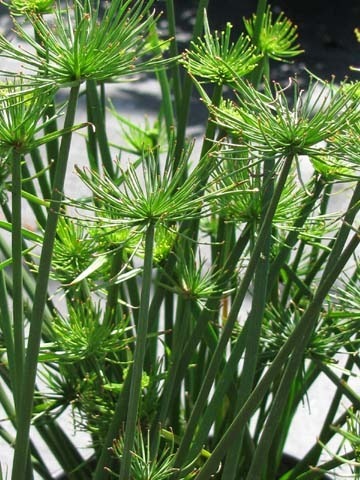 These plants are usually planted in pots, and set in shallow water on shelves or piles of bricks to achieve the correct elevation, or they can be planted directly in soil around a pond or stream. Now that we’ve covered the four types of water plants, we can look at how they come together to create a balanced ecosystem. In aquatic ecosystems, we have four layers that similarly work together to create a balanced ecosystem. This too is a “stacked”” arrangement in terms of utilisation of vertical space, and when these plants are brought together with the right proportions, all the plants in that system benefit. The rules for constructing a water garden to get the “perfect balance” are simple, as listed below. one to two Marginal Plants. Or, conversely, no more than half of the water’s surface should ever be covered with floating plants. Now, with this theory in mind we can look into building a small half-barrel water garden. One of the easiest water gardens to construct is a half-barrel water garden. You can literally use any watertight container of sufficient size to construct a small water garden. 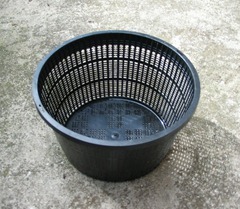 In this project, we’ll use a plastic half-wine barrel liner (pictured below) for our water garden. These liners are rigid containers that can be used without putting them inside a wooden half-wine barrel, and have a capacity of around 100 litres. Whatever container you use, make sure it is clean. A word of warning though, if you intend to put fish in your water garden, do not use any soaps, detergents or chemicals to clean the container, the residue (which won’t be detectable by you) will be present in enough quantities to kill the fish! Gather all the materials required to build the water garden. While building the water garden, place the plants in a small amount of water, and put them in a shady spot, so the plants do not dry out. For deep water plants and delicate oxygenators, put them in a bucket of water until you are ready to use them. When selecting pots to plant up aquatics, plastic is the best material to use because it is lightweight. Use dark coloured containers, black works well, so that they are not as visible through the water. 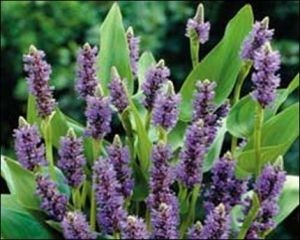 The best soil to use for potting aquatic plants is heavy clay garden soil. Do not use potting mix, as this is too light and floats to the top. Do not use compost, as it will colour the water brown. Planting usually entails removing plants from where they are currently growing and placing them in their new location. When you do this, they take some time to re-establish themselves in their new homes. So, with any replanting, keep the following in mind when deciding to build a water garden. If you are repotting or relocating planted water plants, the best time to do this is during their growing season, from late spring until the end of summer, as they can quickly grow new roots and re-establish themselves. If the plants and in containers (pots), you can move the containers at any time to a different location, even while the plants are dormant. Marginal plants can be planted in regular plastic pots, just make sure you plant only one type (species) of plant per pot, otherwise stronger growing species of plants will take over when they start growing. You can use several of the same plant in the same pot to create a denser planting, which will have more visual appeal. 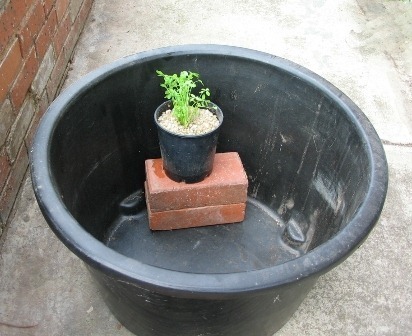 Use black or dark coloured plastic pots so they won’t be visible under the water. A good size plastic pot that can accommodate most marginals, and that is an ideal size for a half barrel water garden id a 6” (15cm) wide pot. For larger plants you could use a 8” (20cm) wide pot. 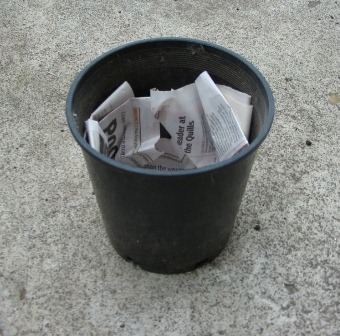 Select an appropriate sized regular black plastic garden pot and line it inside with newspaper so the soil doesn’t leak out. Add soil so that the container half full. Add some fertilizer (such as Osmocote, or a water lily fertilizer tablet) into the soil at the bottom of the pot, this way it doesn’t leach out into the water. Position the marginal plant in the pot with the crown at the top and then add soil around the roots, but leave the crown uncovered. Add a 1-2cm thick layer of pea gravel or river pebbles on top of the soil to hold it in place, but once again leaving the plant’s crown uncovered. Sit the pot in your water garden or pond, at the edge, to create a border or boundary around the water. Sit the pot in your water garden or pond, at the correct height, so that there is 5cm-10cm of water above the crown of the plant (elevate the container by sitting it on bricks or pavers to achieve the correct height if necessary). Water lilies grow from rhizomes. A rhizome is a horizontal underground stem of a plant from which new stems and roots grow. These rhizomes spread quite rapidly, so water lilies are planted in low and wide round or rectangular aquatic basket pots (pictured below). Miniature water lilies are planted in medium sized (20cm) aquatic basket pots. Regular sized water lilies are planted in large sized (30cm) aquatic basket pots. You won’t have to worry about aquatic basket pots unless you are propagating your own water lilies – when you buy a water lily it comes in the correct sized pot, and all you do is sit it at the bottom of your water garden or pond. Lilies can be introduced into your water garden or pond from spring until early autumn. Select the correct sized aquatic basket pot and line it inside with newspaper so the soil doesn’t leak out. Add some fertilizer (such as Osmocote, or water lily fertilizer tablets) into the soil at the bottom of the pot, this way it doesn’t leach out into the water. Position the lily in the pot with the crown at the top and then add soil around the roots, but leave the crown uncovered. Sit the pot in your water garden or pond, at the correct height so that there is 15cm-45cm of water above the crown of the plant (elevate the container by sitting it on bricks or pavers to achieve the correct height if necessary). NOTE: Other types of Rooted Floating Plants are planted the same way as water lilies, but you can use regular black or dark coloured plastic pots, 6-8” (15-20cm) wide instead of the fancy aquatic basket pots. Submerged (Oxygenating) plants absorb their nutrients directly from the water, and as a result, require a lot less soil than other water plants, and can therefore be potted in much smaller pots. These plants are often planted in a pot filled with gravel only, just to anchor the plants to the bottom of the water garden or pot. 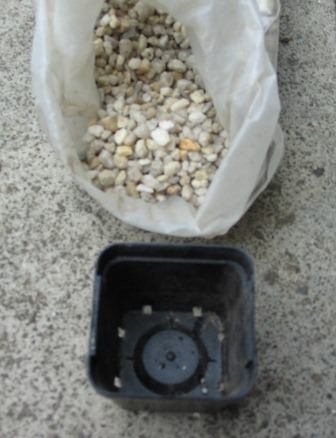 Put the bottom end in a small plastic pot, and fill it with gravel or river pebbles. Floating plants just float on the water’s surface, and their roots hang into the water. These plants do not require pots or soil. 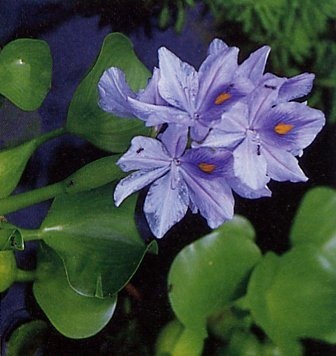 Simply place these plants on the water’s surface and they care for themselves, that’s it! To familiarise ourselves a bit better with the actual process of potting up a water plant, we’ll step through how to pot up a marginal water plant in greater detail, in six easy steps. Line the inside of a plastic pot about two thirds of the way up with newspaper. This is to stop the soil from leaking out of the holes below. 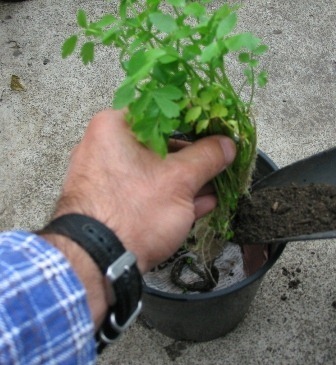 Fill the container about one-third full of soil, then place the roots of the plant in the soil and continue to fill while holding the plant at the correct height in the pot. Be sure not to plant it too deep. You can add several plants of the same type into a single pot if you want a fuller look. Add soil to the correct depth and firm down lightly, so it sits about 4cm below the rim of the pot. 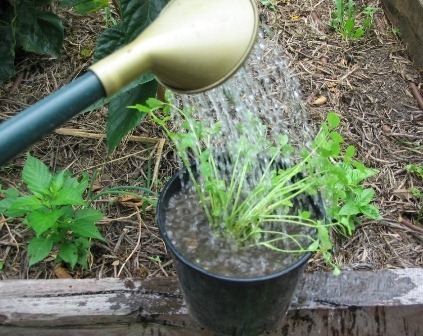 Water the plant to settle the soil around the roots and allow excess water to drain off. 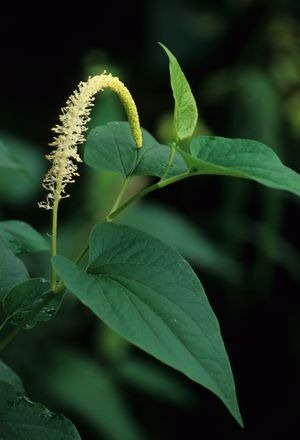 Note: If this plant will go into a water garden with fish, water with rainwater or dechlorinated water, as the chlorine in tap water irritates fishes gills. To stop the soil washing out of the pot, you need to add a layer of river pebbles or pea gravel as top a dressing. To remove any dirt or residue that might cloud or pollute the water, the top dressing needs to be washed. One simple way to washing the top dressing stones is to put them into a pot with drain holes that are smaller than them so they can be rinsed under the tap. Fill small rinsing pot or other suitable container with stones for washing. Rinse top dressing under tap to wash out any dirt. Cover the top layer of soil with about 2cm of river pebbles or pea gravel, stopping about 1cm below the top of the rim. The potted plant is now ready to go into the water garden! As mentioned earlier, the various types of water plants will tolerate a specific height of water above their crown. The “crown” of a plant is the point at which the stem and roots join. As only one level of water exists in a container, we accommodate plants that need shallower water by building “shelves” in the water garden to lift them to the correct height. Typically, marginal plants will have about 5cm of water above their crowns, and one way of elevating them is to use pavers or bricks. Ensure that the pavers or bricks are clean before putting them in your water garden. Stack the pavers or bricks to the right height, and ensure that they are stable and support the base of the pot all way around as shown in the picture below. Here is the marginal plant set to the chosen height, now it’s just a matter of adding the rest of the plants, and filling with water. NOTE: If you are intending to put fish in your water garden, make sure you fill it with rainwater or dechlorinated water. The chlorine in tap water burns fishes gills! The completed water garden, placed in the correct position, all plants placed in the container at the correct heights using pavers, and water added. 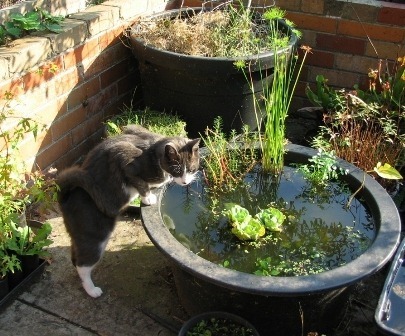 New water garden even passes inspection by the local fauna! 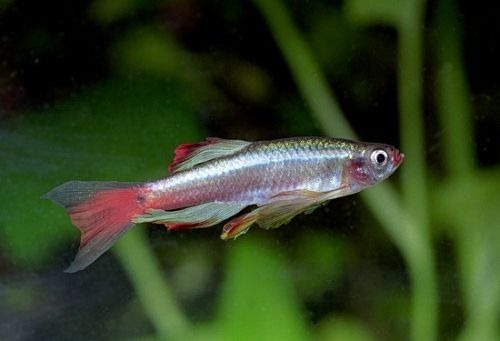 Fish can be added to a newly built water garden to control mosquitoes, though you might give the water garden a week to settle and allow the aquatic ecosystem to stabilise before adding fish. 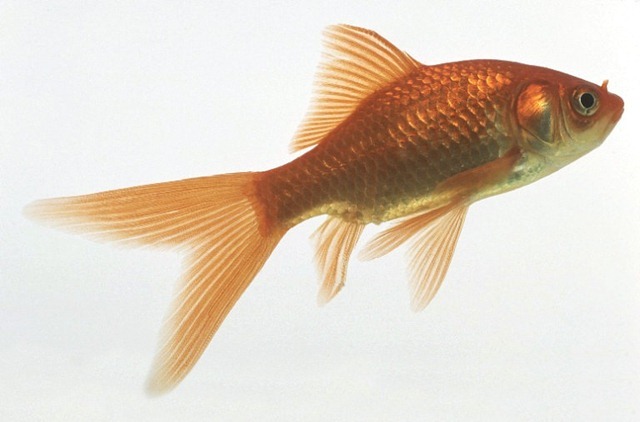 NOTE: The Rice Fish and White Clouds are both small fish and can coexist together, but don’t mix them with Goldfish, which will grow big and possible eat the smaller fish. Frogs need a gently sloped side with shallow water so they can climb out of the water, with lots of water plant cover and shade around the edges, as well as things to hide under on the ground, to stop them getting eaten by birds. A pond set in the ground with a deep end and a shallow one, with heavy planting on the shallow side to create a natural barrier, is better for frogs than a small deep container. If considering frogs,remember that they make a lot of noise at night too! Also, don’t mix fish with tadpoles, the tadpoles will get eaten by most larger fish such as goldfish! Fountains – add water movement and sound and to help oxygenate the water, though keep in mind that some rooted floating plants like water lilies don’t like water splashing on their leaves. Protective covers- made from wire mesh or bird netting stretched over a thin frame or hoop, can protect fish from predators, and discourage birds or cats from turning your water garden into a fishing spot! Once you put together your water garden, it may look a bit sparse at first, as the plants may still need to grow in size to give it the look you want. Be assured that aquatic ecosystems are one of the most prolific and fast growing because of the constant supply of water and nutrient, in no time it will be possibly overgrowing. 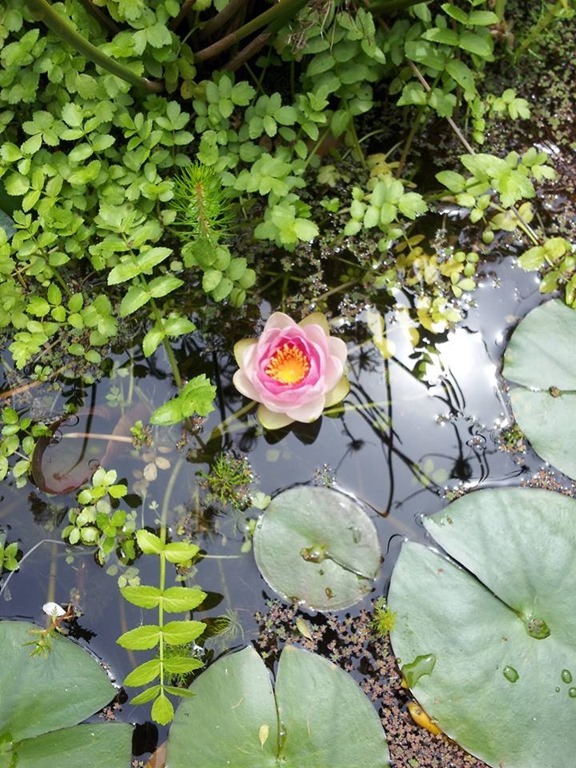 Another point to keep in mind is that after a water garden is constructed, it takes some time to establish the right balance – it is a complex ecosystem and it has to settle in. If the water fills with algae, do not change the water, this is a normal part of the process. With enough shade from floating plants to cut out some of the light, and with the submerged pants growing and taking up excess nutrient in the water, the algae will reduce and disappear. 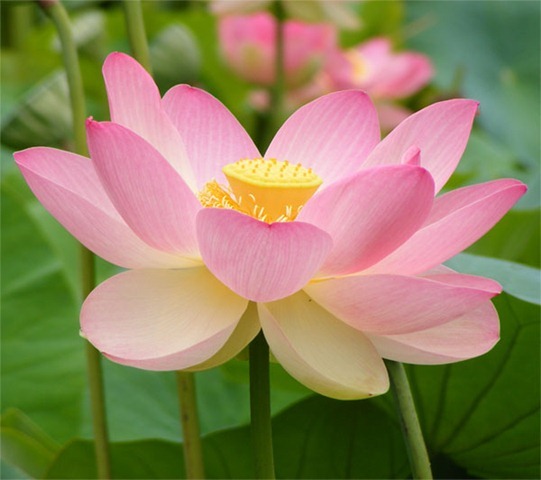 Water lilies are heavy feeders, and should be fertilized every two months during the growing season (spring-autumn or September/October through to April/May) to ensure good flowering. 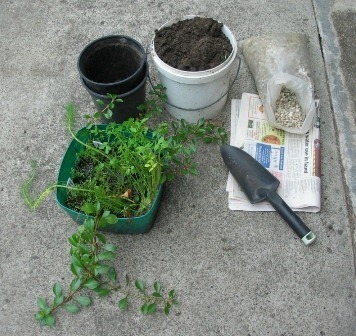 Push a water lily fertilizer tablet into the soil near the roots, or put some slow release fertilizer granules (such as Osmocote) into a folded piece of newspaper or brown paper (this paper isn’t bleached and doesn’t contain harmful chemicals) and push it between the soil and the side of the pot. Remove any dead or dying leaves (yellow or brown leaves) to reduce algae growth, if these are left in the water garden and rot down they will provide nutrients for algae growth. Removing old growth also helps promote new growth. Hardy water lilies can survive in cold areas and do not need to be removed from the water as long as the water does not freeze down to the roots. If the water garden or pond is very deep, and the water lily pot is elevated, then it may be necessary to move the pot even lower to the bottom to ensure that the roots are below the level of the ice. If the water all freezes completely solid, then remove the water lily before this happens. Fertilizer tablets can be pushed into the soil when the plants are flowering. Since many marginal plants multiply by division, you will eventually need to unpot them and divide them up to thin them out a bit, then repot only some of them back into the same pot. This will probably need to be done every 1-3 years. 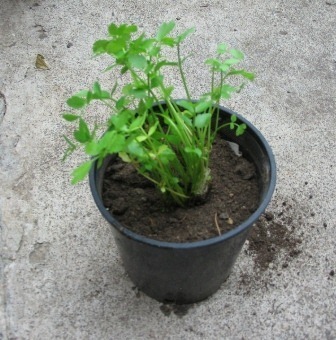 The excess plants can then be repotted to make more plants, this is called propagation by division. Surplus plants can be given away or composted, or used to make more water gardens! With water gardening, you end up with lots of spare plants! Thin out submerged plants if they become overgrown and crowded, especially if there are fish in the water garden and they have very little room left to swim around. The excess plants can be given away, or they can be composted. 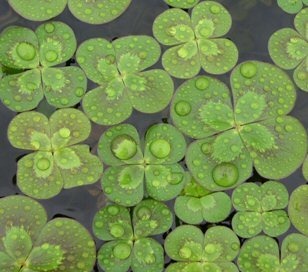 Floating plants reproduce quickly, and can cover the water’s surface. Remember, only one third to one-half of the water’s surface should be covered with free floating and rooted floating plants. This means that any time, no more than half the surface of the water should be covered with floating plants. When they cover up more than half of the surface of the water, scoop them out by hand, with a net, or even a plastic garden pot, and give them away or compost them. As mentioned before, duckweed makes excellent fish food, and azolla makes great food for earthworms in worm farms, so make best use of this free resource where you can. As you can see, water gardens are quite easy to set up, and they can be set up in any container that can hold a reasonable amount of water. Once you have an established water garden, I promise you that you will have so much surplus plants that you won’t know what to do with them all ! So, if you’re lucky enough to know any other water gardeners, you’ll find that they are more than happy to give you spare plants they don’t want, and this way, you can construct your water garden for next to nothing! Your photos and explanations together make an inspiring and informative article. I think I’ll give it a go. Thanks! I am not gay, although I have been known to be happy, but just reading through your detailed instructions makes me want to offer my hand in marriage to you out of sheer joy at your website! Oops did I say marriage? Oops what a dead giveaway. I was just expressing my ummm happiness. (sorry I am part of the Monty Python generation). Your website is most information and nicely organized. Thank you! I have a big pond that has a liner in it. Can you do the aqua garden design with the the lined pond? A big pond with a liner in it will work very well indeed. It will actually work better because there’s more space to work with so you can have more in it! You can build quite an amazing ecosystem in a big pond. Also, it allows you to add flowing water in the form of fountains or cascades, which oxygenate the water. This is great and has so much useful information. Thanks! Thank you for this article. I found a hard plastic pond liner that someone was throwing away and when I googled fun things to do with it, I came across your site. I had been wanting a shishi odoshi and now, I will have a little pond to go with it! THANK YOU!!! Thank you very much. We found this tutorial easier to follow than permies.com and many aquaculture sites. We’re starting with a 55 gal. food tub this weekend! Thanks! Quick question. Re-filling it? Does evaporation gradually deplete it, and mean it has to be re-filled? Or does rainwater balance it out? If re-filling is required, is chlorinated water a complete no-no (even without fish)? In the summer the water will evaporate and the water levels will drop. If you have fish in there you can top up with rainwater, or use tap water that has been treated with aquarium dechlorinator (use the liquid type that you only add a few drops for a whole bucket, don’t use the salts type, it will increase the mineral content with evaporation to make it too high). When you have fish, even when you top up with rainwater, occasionally scoop water out of the water garden with a small container and pour it into your garden. Then top up with rainwater or dechloribated tap water. The fish waste levels will build up in the water over time, and the mineral salt levels in the water will increase due to evaporation. Fish don’t like the levels of these to go to high, and the water plants will reduce the levels a bit, but what you have is excellent fish waste fertilizer, the same liquid nutrient they run aquaponic systems with, so use it in your garden, and replace with fresh water to keep the fish happy. If there is only plants, you can use straight tap water, but the chlorin and ammonia from the chloramine they use to treat the mains water supply will effect any aquatic creatures, so you won’t get the amazing dragonfly and damselfly larvae living there, and frogs won’t be able to inhabit your water garden either. Personally, I never put straight cloruinated water in there, its a whole complex little aquatic ecosystem, and all those chemicals really mess it up.Over winter, it will naturally fill and even overflow, which is fine, becauuse it refreshes the water. Aint it great – I’m a permie in the UK and being inspired by you over in Melbourne. I seem to be drawn back to Australian permaculture teachers over and over. If yoga is said to be India’s greatest gift to the world, permaculture must be Australia’s (aside from its wonderful ecology, of course, which helped spawn pc itself!). Permaculture’s pretty amazing and inspiring, great to know it reaches people worldwide! Thanks! Almost a year later and reading from the US… I too have found the most useful permaculture articles coming from down under. Love the site, great articles, easy to understand and very useful! Thanks for this excellent page. I put together a barrel garden based on your instructions. One question that you may know the answer to…in a closed pond system, where does nitrogen come from? (Well, besides that which is in the lily fertilizer.) Is all nitrogen coming in via the mosquito (or other insect) embryos eaten by the fish? Or does algae fix nitrogen? I understand at a high level how nitrogen flows work in terrestrial ecosystems, but where does nitrogen “come from” in a closed pond system? Thanks Jason, good question. A container water garden works like a regular pond, just on a smaller scale, and the nitrogen comes into the system in a similar way, but it can need some help. 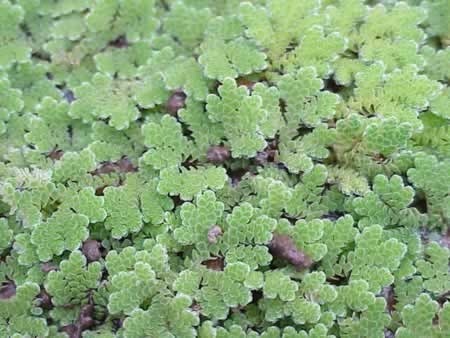 If you have Azolla (fairy moss) in the water garden, it is a tiny nitrogen fixing aqautic fern, it has a symbiotic relationship with nitrogen fixing bacteria, and when it rots down in winter, it adds nitrogen to the system. Nitrogen is added to the system from insects falling into the water, and from small pieces of leaf debris being blown in by the wind. On such a small scale, unless there are lots of insects all year round, there won’t be enough to drive the system, and depending on the fish species employed, people do often use aquarium fish food. Fish can eat insects, algae or plants, or any combination of these, depending on the fish species. I do find it’s best to feed the mountain minnows in my water garden in winter when there are no mosquitos active. Being small scale, it does need some help. Remember that when it rains, the system will overflow and you will lose water, along with nutrient. This is OK because you don’t want the nutrient levels getting too high for the fish. From a Permaculture perspective, you can use the system as a nutrient source if you feed the fish. Take out a bucket of nutrient rich water, and use it on your plants, replace it with rainwater. This way your plants gain the benefit of the same nutrients that aquaponic systems use, fish waste, and the fish get clean water. Works real well. Glad I found this great site! Am relocating my pond (pond liner) to a new site. Big job, nearly there! Re: repotting my water lily. Ideally I’d love to just put some clay, aquatic soil mix and pebbles on bottom for the lily to root into. Has anyone done this successfully? I like the pot you recommend, but am surprised at the newspaper lining. Wouldn’t this break down quickly and with some ink toxins? The reason for growing water liliies in a pot is to restrict their growth and keep them under control. They are heavy feeders and will grow vigorously if you just grow them in the bottom of the pond, they will eventually overrun the pond completely! In a pot they are very well behaved. You’ll be surprised that the newspaper remains intact for a very long time under water, at least a year or more in my experience. May have something to do with the a container at the bottom of a pond being naturally anaerobic (composting newspaper in a compost bin is an aerobic process, uses oxygen). Thankfully newspaper is printed with vegetable based inks these days, so it’s absolutely safe. Make sure you use the ordinary dull textured newspaper, nor glossy printed pages, which shouldn’t even be used in compost because they are bleached with harmful chemicals and printed with synthetic acrylic paint based inks. Thanks for that. 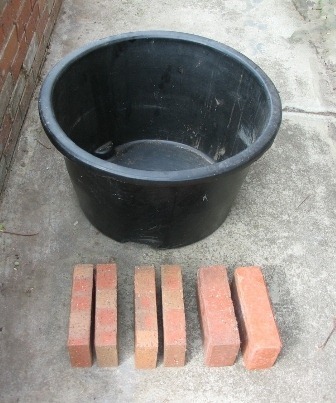 Am having trouble sourcing a “basket” type pot for water lily or a fabric pot – can you recommend a source in Vicoria preferably, or would a homemade one from shadecloth do a suitable job? Hi Christiane, water lily baskets are very easy to find, any shop that sells aquatic plants sells them, easiest to ring them and ask, will send you a list you can try. Actually, the ones in my area don’t and I had trouble getting one off internet, but did manage to buy a black plastic shopping basket not from Coles, Big W or NQR who all have them, but from a smaller more approachable liquor outlet. It’s lined with newspaper and looking good. Thanks for all your great advice. Love your site, and glad there are people out there both doing things like this and also sharing it with the world, kudos. I’ve considered how I would connect my water garden to my hydroponic system to create an aquaponic system, and with my setup it would simply involve one small pump which only needs to run intermittently and can be solar powered to charge a gel-cell battery. The problem with hydroponic/aquaponic systems is that you lose the major ecological benefits of companion planting, stacking, soil ecology – all the things we leverage in Permaculture to increase plant health and vigour, and to naturally control pests and diseases. In my experience hydroponic systems work fine for growing mainly annual vegetables, the plants don’t live long enough to develop any real problems if the system is set up correctly as they only need to stay alive for less than six months. On large scale aquaponic systems, the energy requirements are a bit of a concern. With raising fish, a large 1000 litre of larger open container can increase the scale of production, but then you need to constantly aerate the water at the very minimum, which requires power running continuously to pump the air into the water. My biggest concerns, and criticism of the aquaponic systems I have seen, is the high expense for a small productive area they provide, and even more of a problem is the extensive use of PVC pipes and fittings. In terms of scale, the issue is with the size of growing beds you can support, and the expense of building them. The cost per square foot of productive growing space is high and the systems are not very cost efficient, energy efficient or resilient. I dread when I see the huge amount of PVC ‘plumbing’ on some aquaponic systems, it looks more like a chemical plant than a garden, and most importantly it’s not food grade plastic, it’s extremely toxic and documented to be so, which is why PVC is used in drain pipes for wastewater, not for supply lines! We all remember the fuss about BPA free drinking bottles, well PVC is far worse. With a lot of the aquaponic systems that use PVC pipes, the toxins that get leached out accumulate in the living organisms, the plants and fish, making for a toxic harvest. With recirculating systems the toxic water goes round and round and increases the amounts of toxins that leach into the water. I always wonder why anyone in their right mind would build a system that poisons the harvest when the whole point of growing your own food for increased nutritional value and flavour, and no harmful pesticides or other toxic contaminants. You can build an aquaponic system without PVC, unfortunately many have got it so wrong and build these toxic PVC systems as a matter of practice, probably because PVC is cheap! Aquaculture systems are the most productive systems that exist, and can be built completely naturally or at least way more naturally than aquaponic systems. To be honest, from my five years experience with hydroponics, natural organic systems with soil are far more sustainable, cost effective and energy efficient and just as productive. Hydroponic systems are severely limited in the range of produce plants you can grow and at best offer a additional sideline for limited applications, and definitely not a replacement for growing in soil. Overall, it’s so much easier to just plant in soil, I’m not really sure there is a benefit to the added complexity unless you’re growing annual produce on an area where there’s no soil. 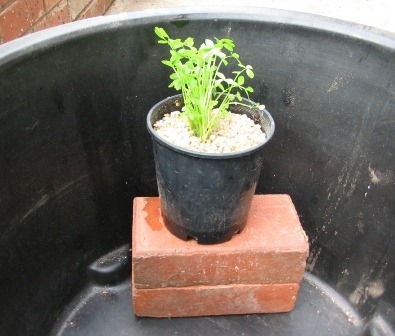 As far as aquaponics goes, I employ a secret ‘low energy’ device, it’s called a bucket! I simply put the bucket in the water garden that holds the fish, and fill it with nutrient rich water. I then walk to a tree and pour the nutrient rich water around a fruit tree. Technically it’s aquaponics, without the worries, complexity, costs, plastics, pumps, pipes and electricity bills! Hello, I have a 1/2 wine barrel with 3 floating plants, 1 snail, and 3 gold fish. Will 2 more goldfish live through the winter in this environment? I plan on getting a heater this fall – I live in Milwaukee, Wi. It’s cold here. Also I have a pump with a filter – for the water to circulate and it seems like I still need to empty the water 100% once a week to clean it. I use well water and it seems to work well, no fish have died since I put in the pump. Any cheap/ simple suggestions on improving the ecosystem? Besides changing the filter regularly I would like to find a way to avoid emptying the barrel every week, especially this winter. I’ve had this pond for 3 months now, looking to improve it if possible. Thanks! Hi Aaron, you shouldn’t need a pump, nor should you need to change the water, it should become a self-supporting ecosystem, just let it establish. Goldfish eventually grow too big for a half wine barrel (I know from experience with just two goldfish), use smaller fish. The idea that you hear from some aquarium enthusiasts that the fish only grow to the size of their tank is a myth! » one to two Marginal Plants. Set it up this way and you’ll be right! In cold weather you can insulate the sides of your half wine barrel water garden by wrapping bubble wrap around it or using polystyrene (Styrofoam) to help it retain heat to stop ice forming. You can also cover the top of the water garden either partially or completely to protect it in cold weather. Any cover must not be placed on the surface of the water as this will prevent gas exchange with the air above it and stop oxygen getting to the water and the fish! If using a cover, it needs to have a decent air space between it and the water surface. You could use a frame of some sort, covered with an insulating material such as polystyrene (Styrofoam). Even using a plastic sheet or tarp to trap an insulating layer of air underneath it can help. One way to prevent the surface freezing in mild frosts is to use ‘pond balls’, these are just plastic balls that float on the surface of the water. You can use two or three ping pong balls in a half wine barrel, or even a tennis ball. The movement of the ball slows down the formation of ice on the water surface. If the pond surface does freeze over, you can simply lift the ball out to make an instant hole which will allow oxygen to enter into the water once again. By the way, if a pond or water garden with fish in it freezes over, never try to break the ice by smashing it, as the shockwaves can kill the fish, and it’s been said that pond liners can be damaged too! To melt surface ice, fill a kettle or similar container with water, boil it, then sit it on the ice and then let it slowly melt its way through the ice. Pumping water can stop ice forming, but you don’t want to be moving water around when the frost is going to be freezing the surface when you have fish in there. When the surface starts freezing, the frozen bits float to the top (since ice floats), leaving the warmer water at the bottom of the pond/water garden, and the fish settle there to protect themselves. If you stir up the water, the fish lose the warmer layer of water at the bottom. Hi Chris, the smallest size with fish that I have built is 100L. Without fish, I have built a water garden in a 40L rectangular plastic crate, which I found had dragonfly nymphs living in it at the time, quite amazing. Not sure if it counts but I have a 9L bucket that has water rushes and water celery growing in it for the last year! Excellent ideas for a water garden, thank you very much! What temperature range could such a water garden have? The temperature range of the climate here is 0°-40°+ Celsius (32° – 104°+ Fahrenheit), average summer temperature is 25.5°C (78°F), average winter temperature is 14°C (57° F). If you don’t know a water gardener, where is the best place to buy water plants? A water garden shop? Many larger garden nurseries sell water plants, failing that there are specialist water gardening stores. 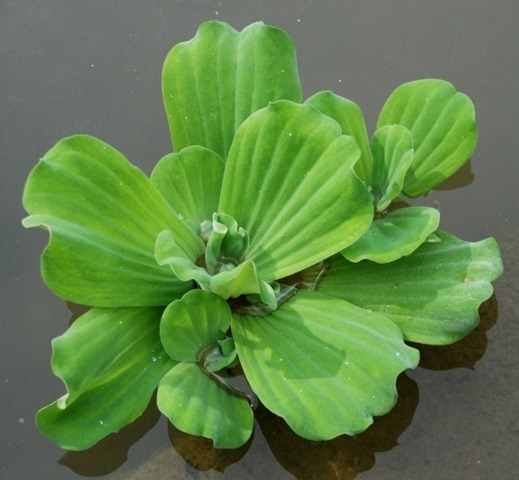 In some cases aquatic plants can be purchased online. 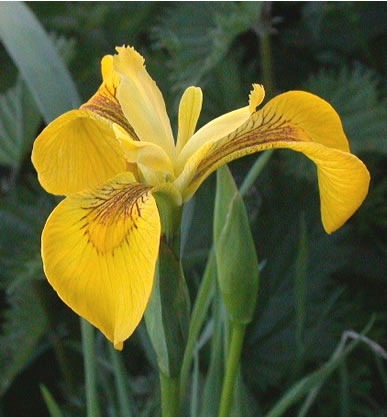 The other possibility is that they can be collected from the wild if the plants you want are native to your area. Is it possible to use sand on the bottom of the pond, and plant oxygenating plants in this medium, rather than using pots.? 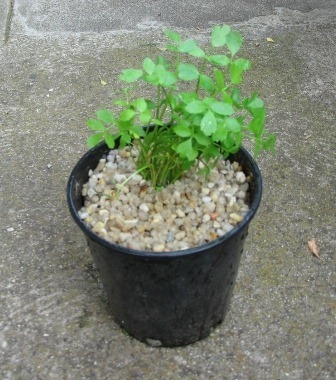 Later, other surface plants could be introduced in pots. If so, what type of sand material should be used? Thanks for the clear instructions about building and maintaining a pond. it is great. I recently bought five very small fish (about 2cm long each), and still had one twice this size.Tthe pond is 70 cm x 30cm x 40 cm deep. It did have a lot of algae, but the fish have enjoyed rectifying this situation. The water is now lovely and clear and the fish are also enjoying the insects and duckweed. There is also a water lilly and water irises. Can you please let me know how I can tell if the water is oxygen depleted? Is this only if there is too much nitrogen and the water is cloudy? If the oxygen in the water is low, the fish will be at the surface gasping for breath, that’s a dead giveaway there is a problem. When the water temperature is high, such as on a hot day, the water has reduced oxygen holding capacity, that’s when you’ll notice it more. how to clean? b4 i set up plants etc.. i am not sinking the bath. is it best to position in shade. thank u for such a user friendly site. I am about to build a pond on my farm. It is covered in trees witha slight gradient. There does not seem to be any natural water flow – that i can see. i was just going to put the pond at the ‘top’ of my (to-be) edible forest. is this the best place for it? can i use it for irrigation? I live in Melbourne and am looking at making a water garden with fish, I have two questions. . I wad thinking it might be nice to have a raised edge (10cm or so) and partially cover the pond with glass so it can double as a functional outdoor side table. Do you believe the ecosystem coulf handle that or would airflow be too restrictive? I also want to look into how the fish might react to that. Second, do you know of good nurseries here that I should go to? I love your through instructions. The pictures make it perfect. I was wondering if this water garden can be kept indoors. Apartment living with no patio or deck. Am Zen decorating. Water gardens such as the ones described in this article are designed for outdoors. So glad I read this before emptying my water garden. It started to grow algae and I was tempted to dump it and start again. My duckweed died before it arrived to me so there wasn’t adequate shade. But I received a new shipment today and it appears to be healthy. I love to see the garden change and take on a life of it’s own. Hopefully this algae bloom will end soon. Thanks for the great article. Thank you for the helpful article! Would this water garden be suitable for having inside, provided I can find a space with enough light? Most indoor spaces won’t have enough light to support water plants that require full sun or even part shade. Aquarium plants are what would be considered low light plants that grow in a well lit indoor space, but now were really looking at aquariums rather than water gardens. I am so grateful for finding your very informative site. I am in Sydney. 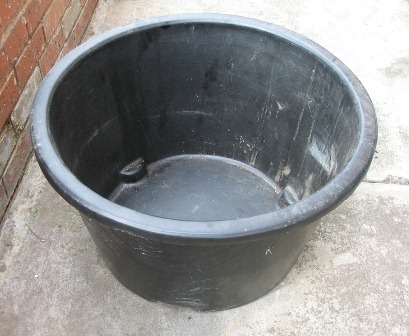 I would like to grow edible plants, I am hoping to use an old cement wash tub for a water garden I have had for 20 years, growing plants in soil. Would there be an adverse effects?? Could you please advise what edible plants to purchase. I also want to encourage a frog habitat and will try to incorporate this somehow. Hi, great website, thanks for sharing your experience. I have followed your advice and created a 720mm dia x 390mm H pond. 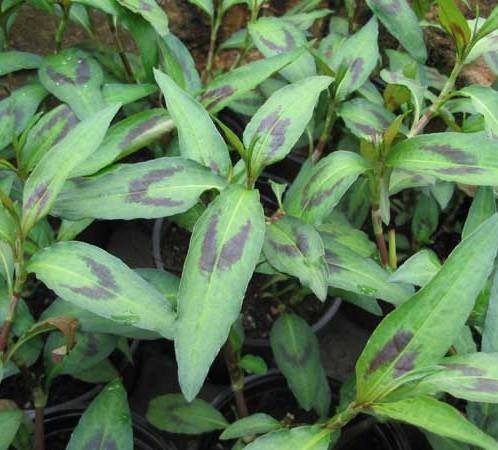 I have 2 small pots of valisneria currently as my oxygenator plants (I like these as they don’t appear to be the kind that will overtake the underwater of the pond all the way to surface like some others – I hope they can be more like a ground cover on the bottom). Will they be suitable? 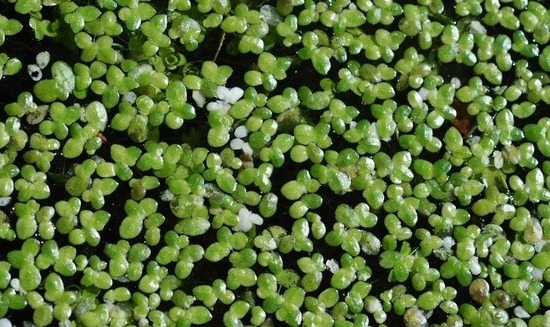 Is it possible to use sand on the bottom of the pond, and plant the valisneria in this medium, rather than using pots? I would keep all the other plants in pots. If so, what type of sand material should be used? Is this suitable or not? Hoping you can help clarify. Yes, Vallisneria is an oxygenator plant. Ground cover plants are terrestrial, they can be found on pond edges or in very shallow water, examples of these include water crassula. 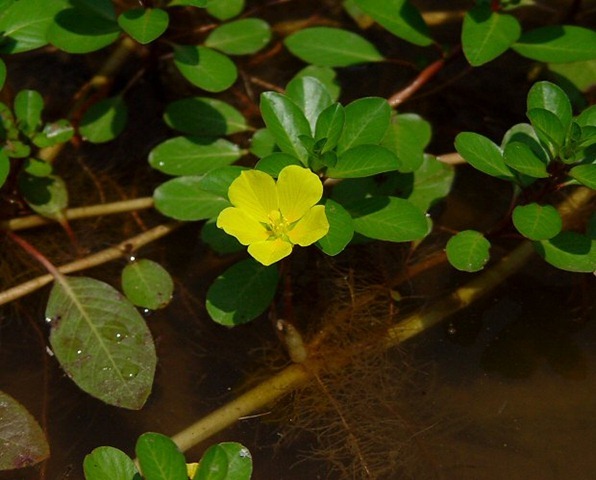 Plants don’t grow as flat, low ground covers deep in the water on the bottom of ponds, they won’t get any light, oxygenators grow up from the bottom and can often be emergent, rising up out of the water’s surface, milfoils are an example of this. You don’t need sand in the bottom of a pond, it will cloud the water, a natural sediment of organic matter will gather there over time. As mentioned in the article many oxygenators can be anchored to the bottom by placing the roots in a small pot filled with rocks for weight. Eventually they will root into the sediment and stay anchored as they spread. Thank you so much!!! We will be putting in a water garden in our Unitarian Church this Spring and this is such a help. I plan to quote you a lot!! You’ve thought of everything. 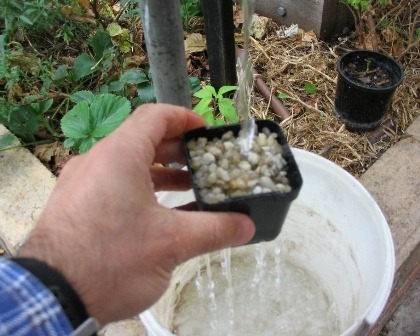 This has to be one of the best diy water garden articles on the net! Thank you for all the information, I will try to put the knowledge gained here to use during the summer. Thank you for the information. I have a small pot pond with water lilies in it. Just started. How often do I need to change the water ? I would not put a fountain in a small water garden if you have a water lily planted, and to drive a waterfall the smallest of aquarium pumps would be more than enough. Unfortunately, small pumps don’t have very good inlet filters and tend to clog easily. I’ve run one before and they are a nuisance as far as maintenance goes when the pump gets blocked. You don’t want a large pump with lots of water movement as that will disturb the sediment at the bottom of the pond and make the water dirty, which would be bad for fish. I would personally avoid pumps in small water gardens, their natural stillness is where their beauty lies. At this size, if you wanted a fountain, it would be a dedicated fountain with maybe a token marginal plant, but not a water garden. Hi I have 3 bathtubs which I would like to turn into edible water gardens using the four types of water plants together to create a balanced ecosystem. I would like to include in the system: water spinach, water chestnuts, Vietnamese mint and any other edibles that you think would be suitable. However other than the Vietnamese mint which is a marginal plant I am unsure which type the others are. I am also thinking of including one water lily per tub. I estimate the tubs to be 50-60cm wide by 1-1.2m long. Any suggestions would be more than welcome. Water spinach and water chestnuts are all aquatic marginal or bog plants. Water parsley (Oenanthe javanica), water celery (Berula erecta) and Watercress Nasturtium officinale) are other possibilities. If you convert one bathtub to a complete bog garden, fill it with soil and fill with water at the soil level, you can grow Taro (Colocasia esculenta), as the tubers grow quite large. You can also grow Lotus as the root is edible. That should get you started! Wow! After reading this I am inspired to make one at my backyard. Hi, I was just wondering if cane toads are a problem in these systems, I live in Brisbane and there are a large amount of cane toads and I was wondered if they cause a problem in these water gardens? Is there a fish that will eat the tadpoles? I wouldn’t know to be honest if cane toads are problematic for small water gardens as cane toads have not made their way down to the southern states… yet! 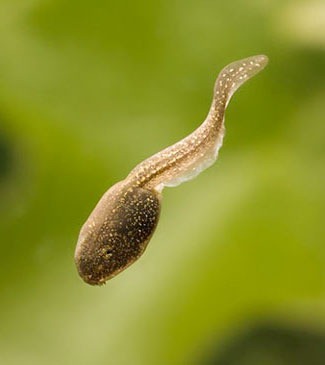 Unfortunately cane toad tadpoles and eggs are poisonous just like the adults. Hi, in our bath pond the algae keeps taking over. The oxygenating plants are dying. Is this because we haven’t fertilised? Is the algae growing because of dying oxygenation plants? Cheers! Most likely the algae is growing because your oxygenator plants are dying! If algae is growing there is enough nutrients in the water, fertilising will only make it much worse. Why are your oxygenator plants dying, this is highly irregular, not enough sunlight? Hi Catherine. Have you included fish in your water garden? 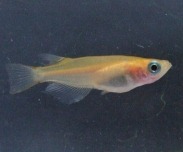 I have introduced the northern rivers fire gudgeon which is native to where I live. I purchased them at the local aquarium/pet shop. I believe that it is important to introduce only local species. Snails have also come in of their own accord. My water gardens are thriving. Fabulous article, so we’ll described, can’t wait to get going…. Do you have a particular supplier of plants that you recommend? Being an international website it depends on where you are in the world. Goodness, it sounds terrible! The bubbling and bad smell is due to organic matter such as leaves falling into the pond, sinking to the bottom and rotting, the water there becomes anaerobic (without oxygen) and foul smelling. 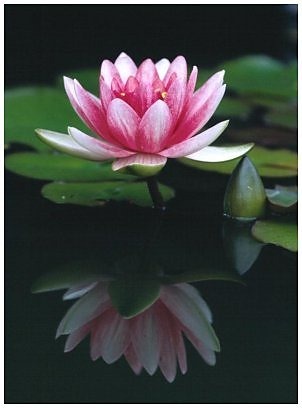 Your water lily may have become smothered due to lack of light from all the muck in the water. 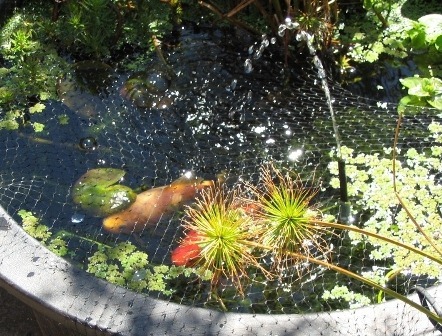 There are a few considerations when selecting a water pump for your pond. First is the type of filter (if any) that you want to use, which will be based on the amount of plants and fish (if any) and amount of sunlight your pond gets. To select the correct capacity pump, you need to determine the ‘Effective Pond Volume’ and then choose a pump that will circulate this volume at least once every two hours at a minimum. Say your pond holds 1000L (260 US gallons) then you’ll need a pump with a flow rate of 500L/hour (130 gallons/hour). A pond size of 1m x 1.5m doesn’t tell me anything because it all depends how deep it is, which determines total volume, hence pump size. Keep in mind that solar pumps have a limited capacity and only work in sunny weather. You can probably appreciate why we design ecologically self-sustaining low-energy water gardens such as the one in this article. With the right number of plants and fish it becomes a balanced ecosystem that only requires minimal maintenance. Thanks for getting back to me so promptly. I would prefer not to have a pump and would like to have an ecologically self-sustaining low-energy water garden. I also don’t need to have fish. The pond is about half a metre deep. The pond gets direct sunlight about 4 hours a day. Okay, 1.5x1x0.5m would give you a maximum volume of 750L, you’ll need a pump with a flow rate of around 400L/hour, you can get solar pumps with this capacity. Luckily some have 5m long cables so you can position the solar panel away from the pond in a location where there’s more sun. Not sure if you have enough sunlight for water lilies with just 4 hours a day, it’s unlikely they’ll flower or even stay healthy with such a short period of sunlight. Very interesting reading here. I have one question. I’m concerned about containers being safe for fish. One I have in mind is made out of resin and it looks like a black half wine barrel. Its water tight of course but the material its made out of. I wonder if its toxic to fish. I also think about using some ceramic type pots to make water gardens too and wonder if those might also be toxic to fish. I know there are liners I could use and will if I have to but I would like to not have to. That’s probably impossible to answer as there are at least 30 different plastic resins I can find when I do an internet search on the term, you might have to contact the manufacturer and find out exactly what resin is used in the product. Next issue is if it’s painted on the inside. Then you would be able to determine if it is safe for fish. Odds are that it wouldn’t be suitable, the criteria for construction is most likely aesthetic – how it looks, rather than being fish0safe. You can use butyl rubber pond liner, or purchase a half-barrel liner from a pond supplier like the one pictured in this article and put that inside it. Yea I figured as much. I’m probably going to have to go online and order a pond liner because our local garden stores do not have any. They carry the wood half barrels but no in certs for them. Thank you for your help and advice. I learned a lot here and plan to read it all again when I’m ready to put my container garden together. Have you ever had any problems with snails like pond snail??? Don’t the fish poo and leaves build up on the bottom, ruining the water in the long term? Even by replacing some water from the top the poo still remains on the bottom doesn’t it? What plants would you recommend for someone that has dogs? Hi Jenny, I’ve never heard of problems with water gardens, the plants in them, and dogs. If dogs can reach the water they might drink from the water garden much like cats do though. But in a natural environment there’s water flow which changes the water. A reason farmed Tasmania salmon are so sick is because there isn’t enough water flow for the fish. Salmon are a fish species that lives in flowing water such as rivers, they aren’t a species that lives in contained bodies of still water such as ponds and lakes. Farmed salmon are also fed food pellets, which is not their natural diet. No wonder they’re not healthy. In a water garden we are trying to emulating Nature’s pond ecosystems, so we need the plants to recycle waste and nutrients. I remove 1/3 of the water frequently and use it in the garden as it contains nutrients which the plants can use, and top up with fresh rainwater. I have a 20 gal tub, with 1 water lily, 1 goldfish, with some Anacharis and Pistia. It gets morning sun, outdoors in coastal southern California. How often should I add fresh water, and do I need to suction the waste out from the bottom (fish waste) or scoop it out the top to save the beneficial bacteria? Excellent. I’m just starting out, thinking about creating a small water garden for use on my apartment deck. This article was super helpful, thank you. I am in Melbourne and have tried to establish a water garden in a half wine barrels. After several months the water went black and became quite foul smelling. It had lots of mosquito. Just wondering if you have any ideas? I had 2 types of oxygenating plants mifoil and Eloisa together with one marginal lily and some frogbit. The barrel was not lined and was quite well shaded. I did not have a pump. I was wanting to try again and would appreciate and suggestions? Hi Carolyn, other than Elodea (Anacharis) which is an aquatic shade plant, the rest of those water plants (most water plants in fact) need sunlight, and would have rotted away into a horrible, anaerobic mess, the black water you describe. Use a location that gets more light and it should all work fine, the sunlight provides the energy source that powers the whole mini-ecosystem. Hi – this post is so helpful, but I have a very basic (stupid) question. I purchased aquatic soil (API Pond Aquatic Media) which looks nothing like the soil you’re using. Will this be sufficient for water lilies and lotus, or do I need to put a layer of dark soil and then this stuff on top? Thank you so much. Regardless of this confusion my cats are using the pond exactly as pictured, so at least two members of my household can follow direction. Hi Lance, aquatic potting soil may vary in its composition, it just has to hold water and nutrients , be reasonably heavy and not float to the surface, something that clay loam garden soil dies really well. In nature, the aquatic potting medium is in fact a a clay loam soil. If your purchased aquatic potting medium is a good product and works fine, then by all means feel free to use it. I’m finally moving from an apartment into a house with a yard and I got so excited when my friend gave me the idea to have a water garden! I had no idea there were so many different kinds of plant options, I think the rooted floating plants like the lotus and the water lily are my favorite. It was also so helpful to know to use heavy clay garden soil instead of potting soil.